DIY Paper Gift Bags : How to Make Easy Paper Bag For Your Loved Ones! 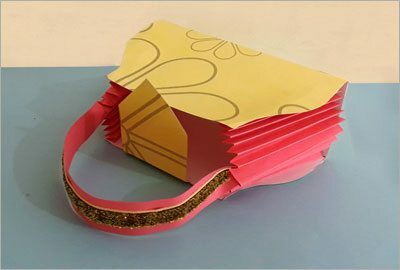 How to Make Easy DIY Paper Gift Bags? Cute adorable gift bags are loved by all, especially ladies. Isn’t it wonderful to have a customized paper gift bag for every occasion? Gift paper bags also come in handy when you want to gift your loved one for a special occasion. Be it a dinner date, or a birthday or a wedding present, you can put your precious gift in a lovely designed gift bag before offering it to your loved one. DIY Paper Gift bags are creative and pretty. Wondering how to make a gift bag for your loved one? 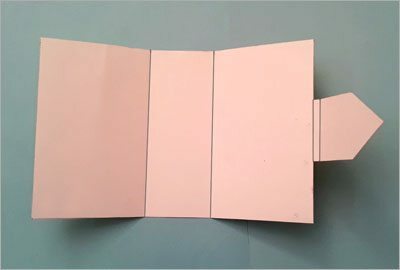 All you need to follow is a simple step by step procedure using a color paper or cardboard. 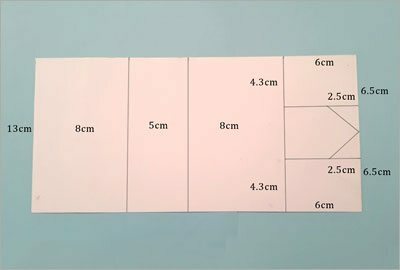 Cut the printed paper measuring 27 cm in length. On the cut paper marks the dimensions 8 cm, 5 cm, and 8 cm. 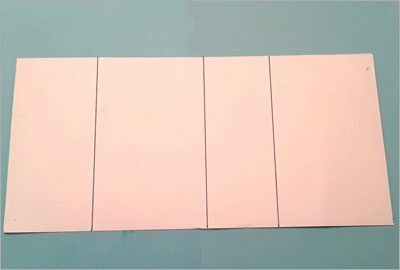 Mark the width of 13 cm on this paper and cut the paper. Horizontally mark 4.3 cm. Vertically, mark the dimensions 2.5 cm on the paper. 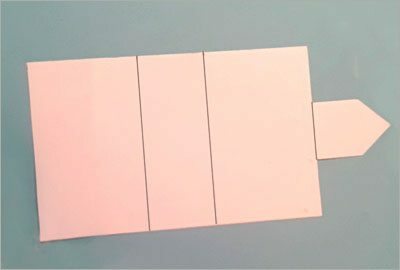 Mark 6.5 cm using a ruler to divide the width in half and cut the remaining portion of the paper on the sides. This forms the additional hanging off the gift bag that helps in the closing of the bag. Slightly run the cutter on the markings for easy folding. On the additional hanging off the gift bag, mark the distance measuring 0.5 cm. Take a color paper and using a stencil make curve lines. Draw the curve lines using curve stencil. 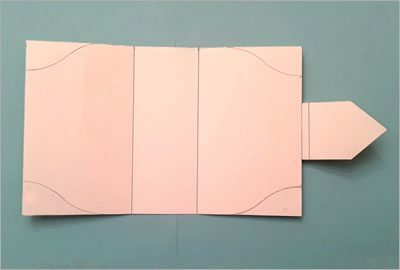 – Cut the curve on the markings made on the paper. You will get the shape of the bag. 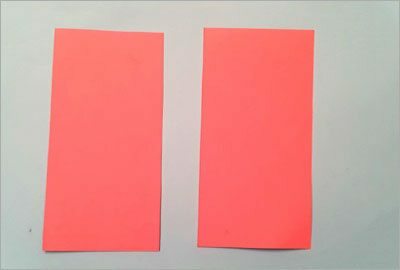 – Cut a plain color paper measuring 16×8 cm. We need 2 such pieces of colored paper. 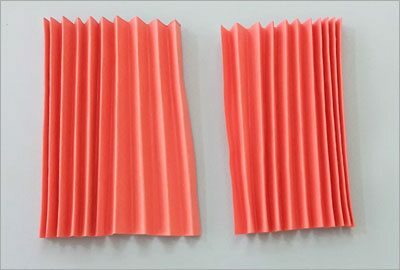 Now fold the paper in a zig-zag manner like a fan. Explore how to make DIY clutch bag handmade gift! 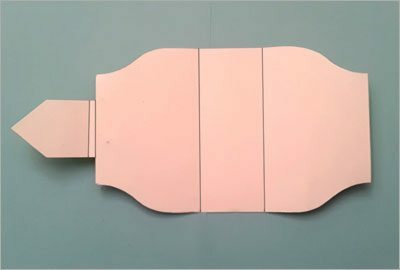 Paste the fan like structures on either corner to make the sides of the bag. Cut another color paper measuring 2 cm to make the handle of the bag. Cut and paste the decorative lace in the middle. Paste the handle on the bag on either side. 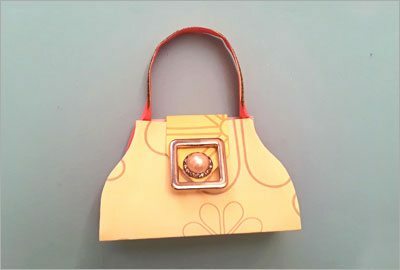 Let us learn how to make this DIY Cute Handmade Mini Paper Bag. Now paste the Velcro on the flap of the bag, using a glue gun. Paste decorative beads on the flap of the bag. 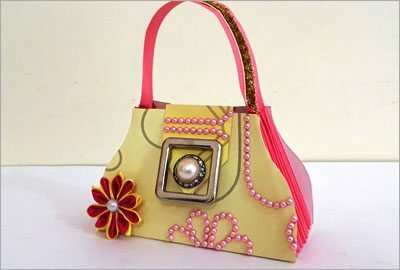 Decorate the bag using decorative pearls and flowers. Your easy DIY paper bag is ready. 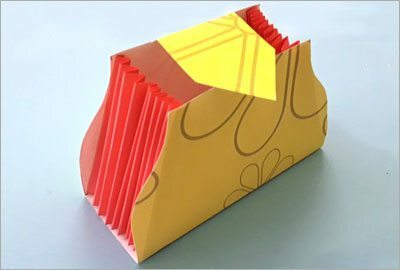 DIY Paper gift bags can be easily customized using different color papers and cardboards. 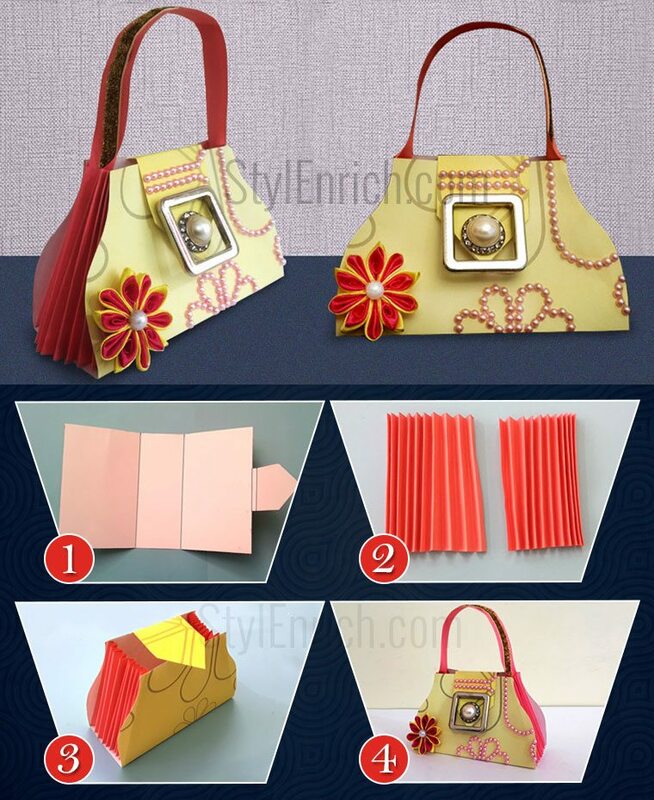 You can use this paper bag as a personal handbag or use it to place your gift inside it before gifting your loved one. You now no longer need to buy decorative boxes or bags to place your gifts. Making your own gift bag is an inexpensive and creative way to surprise and amaze your loved ones!! 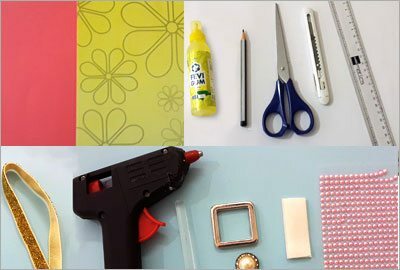 How to Make a Beautiful DIY Peacock Shaped Organizer from Plastic Spoons? How to Make Newspaper Handbag – DIY Newspaper Craft! How to Make Easy DIY Fabric Flowers in Just 5 Minutes? Easy DIY Wall Art : How To Make Amazing Quilling Princess Wall Frame! 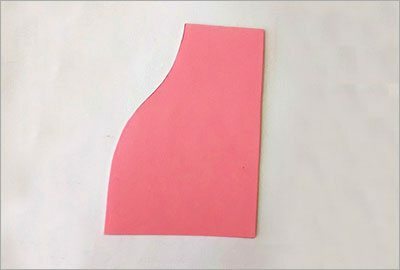 DIY Valentines Cards : How to Make Heart Pop-Up Love Card? Beautiful Satin Ribbon Flower DIY Hair Accessories! FREE Download : Stencil Template for Cute Twisted DIY Paper Box!